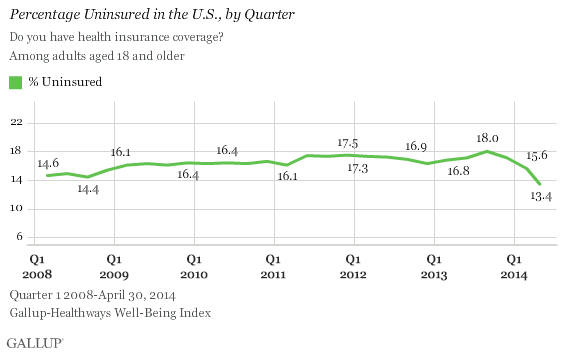 Gallup reports a further drop in the percent who report being uninsured to 13.4 percent, representing a new low since they started polling on this topic in 2008. The decrease shows the effects of the Affordable Care Act despite claims by many Republicans that the number of uninsured has increased rather than decease. Opposition to the individual mandate is a plausible position to take, ignoring the fact that it was a position commonly proposed by Republicans until Obama adopted it as part of the Affordable Care Act. Regardless of how one feels about the mandate it is hardly comparable to the Holocaust. It is also possible that the mandate has influenced the number who obtained coverage, but this is what the law was designed to do. It is questionable how many people did sign up due to the mandate, as opposed to simply wanting to obtain health care coverage, considering that for the first year the penalty is both small and easily avoidable. On the other hand, the number covered would be higher if many Republican-controlled states weren’t blocking Medicaid expansion despite this program being paid for primarily by the federal government. The Affordable Care Act has made it possible for many people who could not obtain insurance in the past to now do so. I have posted examples of people who have benefited from the law in previous posts. The Commonwealth Fund has this page with additional examples. One of the cases they looked at previously paid $600 a month for a plan with a $50000 deductible. Their current plan purchased in the new exchanges cost $192 with a $500 deductible and broader coverage after the tax credits were factored in. Other people could not purchase insurance at all due to having pre-existing medical conditions.